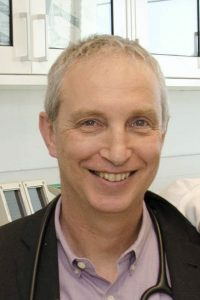 Dr. Uri Tabori, Toronto’s Hospital for Sick Children. Being a pediatric oncologist can be heartbreaking. But every so often a glimmer of hope arises – often from the most unexpected places. Dr. Uri Tabori, an oncologist at Toronto’s Hospital for Sick Children, together with several physicians and scientists, is leading a unique international consortium that helps treat children’s cancers around the world. These include patients in developing countries where the resources just aren’t available. A few years ago, they noticed that children in countries in the Middle East and South Asia, such as Pakistan, Saudi Arabia and Jordan, were being diagnosed with a cancer that should have been slow moving but that progressed, resulting in the death of the children within months. Using whole genome sequencing analysis, the consortium was able to determine that these children’s tumours have genetic mutations 1000-fold more than what would be seen in a normally mutating cancer. “We call these tumours hypermutant cancers,” says Dr Tabori. Further, they were able to determine why. These children lacked an inborn ability to correct genetic mutations that creep into DNA as cells replicate themselves. They found that although the syndrome, called biallelic mismatch repair deficiency, or bMMRD, is rare, hypermutation affect a significant portion of both children and adults with cancer – 5-10% in the case of children and 15-20% for adults. Further, it didn’t matter what kind of cancer it was – the figures held true. And, even more significant, they found that patients with bMMRD, who develop hypermutant cancers as a result, respond particularly well to checkpoint inhibitors – a kind of immunotherapy that involves working around the cancer’s ability to block immune cells from attacking it. So Dr. Tabori and the international consortium started to treat these children with checkpoint inhibitors. The first two patients were Canadian children, both of whom had relapsed glioblastoma, a tumour for which survival is less than three months. After receiving the treatment, both children’s tumours responded dramatically. One child eventually died, while the other has survived and remains disease free. With these encouraging results, Bristol-Myers Squibb funded the first hypermutant pediatric cancer trial, led by Drs. Eric Bouffet (head of the International Society of Pediatric Oncology) and Tabori. This international trial is now active in Canada and launching in Philadelphia, Paris and Israel this year. Now, SickKids, with an Enabling grant from BioCanRx, is leading the companion biomarker studies for this international trial, to determine who among patients with bMMRD is most likely to benefit from immunotherapy. Dr. Tabori is working with his colleagues from the international consortium, Dr. Bouffet, Carol Durno (a gastr-enterologist) and Melyssa Aronson (a genetic counsellor and world expert on mismatch repair), as well as his research associate at SickKids, Dr. Adam Schlien, to identify biomarkers that might indicate susceptibility to immunotherapy among patients with bMMRD and to disseminate these biomarkers as quickly as possible to enable oncologists to better predict which of their patients will respond best to immunotherapy. The research has several goals. Dr. Tabori and his colleagues are looking for genetic signatures that can identify who is most likely to respond to immunotherapy. They are also looking for which immune cells are leading the fight against hypermutant cancers, so that they can enrich these cells to heighten the immune response. The icing on the cake for this project, says Dr. Tabori, would be to develop a non-invasive blood test that would enable oncologists to determine who these patients are without needing an invasive biopsy. But Dr. Tabori is looking even further afield. “This syndrome teaches us about common cancers too,” he says. “Our knowledge can be transferred to many other cancers.” Indeed, as the recipient of an Enabling grant from BioCanRx, Dr. Tabori expects his work to be widely applicable, not just to children but also to adults with hypermutant cancers. Dr. Tabori and his team are disseminating their data through all the traditional means – papers, conference presentations. Uniquely, though, they are also using the consortium website and social media, such as Twitter, to share their results. And it’s working – more than half the children participating in the research have come after hearing about it on these platforms.